This is probably the most exciting aspect of the forest we discussed and Close to Nature-continuous cover LISS forest management in general – the forest naturally regenerating. This is one of my favourite parts of the forest to observe, film and tend; the vigour of the young Ash conveys how well suited this site is for Ash. Such naturally occurring Ash, if thinned in time to keep the growing trees less stressed will also be an important measure in controlling ‘Ash Dieback disease’ too (overcrowded, single sourced trees will be more prone to any disease). The brambles may look messy but they protect the young trees very well and Ash trees have no problem growing up through it. Nearby we noted how other species were coming into the forest. Our site is bordered by a hedge that was left un-managed for years. The tall hedge trees and shrubs species did a great job in naturally introducing species into the forest; this is where this Holly came from. We discussed how important it is to keep an eye on protecting younger trees; in this case the tender leader (shoot) of this young tree could be very easily damaged by the conifers in the wind with their sharp needles – so best to get back into the habit of walking through the forest with my saw again. This is our largest grove of Alder, again it developed close to the hedge and has other species developing as an understory. It was left un-managed for 15 years hence the trees been so skinny and tall. We had taken out a few Alder here last week but I was told to take out about another 30 percent, marking first the strongest, straightest specimens to keep, and creating light gaps around these trees’ crowns (the top part of the tree) by removing competing, less vigourous or less straight trees. I don’t think many foresters had ever seen brash (the branches removed on thinning or pruning) arranged so artistically. My husband is a sculptor but to give Paddy credit he instantly said how like Ady Goldsworthy’s work this was. We leave the brash to decay to enrich the soil – an important concept in Close to Nature forestry. Paddy and Padraig both agreed that more selective harvesting of the conifers was needed – it was still too dark in places; I was told to remove the ‘wolf’ or as Padraig called them, ‘bully trees’ that were taking all the nutrients in an area and depriving other better trees. The wolf trees are the trees with the larger bases, often very branched too. Also remove trees whose trunks were bending; the best trees in this image are the straight but thinner trees on the extreme left and right. Like everywhere in Ireland, the wet, mild climate means we have the fastest tree growth rates in Europe. The leader growth on this young oak is several feet just from last summer alone!!! Paddy was saying this clearing will be completely overgrown by the conifers in 5 years!!! He suggested it was a great place to bring in new species and suggested trying Beech and Western Red Cedar but not to plant too closely at all to the conifers which create so much shade and would slow the new trees growth. And I was told to think that trees are not only putting on 3 feet of height each year but 3 feet in all directions. This is another example of a wolf tree. Its bulging at the botton and knotty with branches. Instead it would be better to focus on very straight trees with minimal branching (this is not a great photo as branches from other trees are in front of this very good tree but I think you can see how straight and branch free it is at its base) Padraig was saying when you select and retain such trees you are improving the overall genetic quality of the forest for the future. Even if you are tending a forest mainly for biodiversity, its best to keep the straightest trees to provide some income to keep managing the forest. For e.g the cost of the recent thinning was more than paid for by the firewood we got. When we first began thinking about managing our forest we planted species in the wrong places; these grey Alder are just sitting in this shade after a number of years and need the bigger conifers removed. Its a bit hard to see but there is a young Irish Bird Cherry here in front of the Sikta spruce; I planted this for biodiversity and its one of the earliest leafed with attractive, simple blossoms. Paddy again said I need to keep and eye on any conifers that would encroach upon its light and young shoots. Its loving this site so may get some more for other areas. This might look like a mess but even in this part there is (with more thinning) great potential to have broadleaves and conifers growing well together. Padraig was saying eventually there will only be 3 or 4 trees here; when the forest gets really big. Still find it hard to imagine our forest changing so much but it has, even in just the four years since we last thinned. Not quite a year ago I was putting up a notice online for ProSilva Ireland’s website (I help look after their online communications) about Ireland’s forest research organisation COFORD. COFORD was asking public and private landowners who were managing their forests using Close-to-Nature methods (this term is more recognised in Europe but it gives an important emphasis of the overall strategy behind this new type of forest management) or also known as low impact silviculture systems (LISS)-continuous cover methods, to list themselves on a new database as part of a new survey of changing forest methods in Ireland. As our forest site is barely 2.5 acres I was unsure whether I would be laughed at for wanting to list our Hollywood forest on the database but I was warmly encouraged by those leading the project, that no forest “was too big or too small” to be included. As you will know from my last post I had in the last week managed to get our wee forest thinned and just in time as I was rung by the LISS team to say my forest had been selected for inspection a few days later. 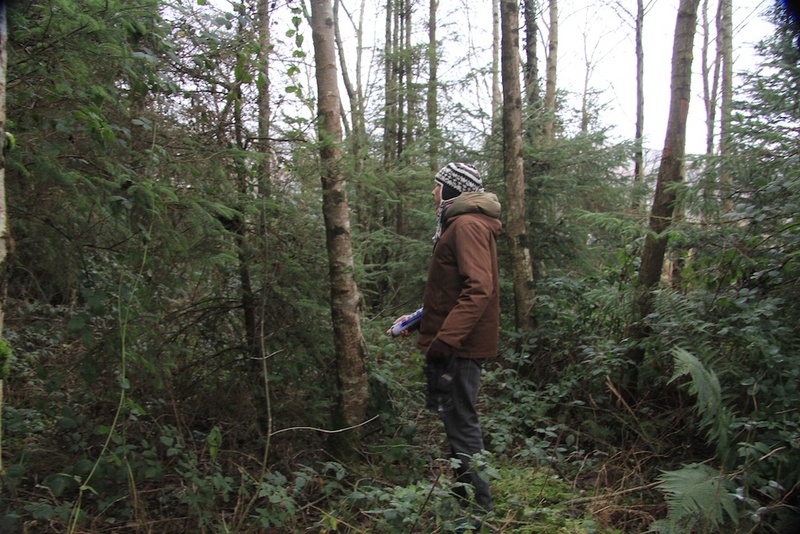 The inspection was on Friday (25 Jan) and while we had great sunny weather earlier in the week for the thinning, it was pouring rain here when the two foresters, Padriag O’Tuama, Paddy Purser and LISS forest doctoral researcher, Lucy, came to visit. But luckily there was a good break in all that rain for us to look and for me to show them what we’d been trying to do with the forest, and observations that we had gathered living here over the last decade. I knew the two foresters from the ProSilva Ireland open forest study days I’ve attended over the years but it is a different experience when your own forest is been examined by professionals. It was great though, and what a treat to have the areas that I look at so often, looked at by such experienced eyes. I went around today, after more heavy rain yesterday and took these photos and notes to remind me of all the comments and great advice Padraig, Paddy and Lucy had given me. I feel very lucky that Hollywood has got input from some of the most forward thinking foresters in the country. A lot of ‘seeing the forest’ for me, in my work as an artist has been helped enormously by talking with how foresters keenly see trees, soil and light conditions and they just can’t help themselves thinking and practicing for the long term. There is such a lot going on even in such a tiny forest too and foresters easily visualise things decades hence if such and such a area is thinned, pruned, if new species are brought in or probably the most important, how areas that are naturally regenerating will evolve and how to maximise this too. I know now that I have to thin little and often and on our site, we need to do this every three years and also some areas could do with new plantings of other species (something I will get onto soon, in this planting season). My great thanks to Padriag, Paddy and Lucy for coming and including Hollywood in the LISS survey. It was heartening to hear too that close to 300 sites are listed on the database and surprising to hear was that most of sites are public, not private. In fact a great number of Coillte sites have been put forward but the survey is revealing that complete understanding of Close-to-Nature-continuous cover LISS forest management is still low in many of the sites recently surveyed but it is changing. Many think that such forests are simply forests which are not clear-felled but Close-to-Nature-continuous cover LISS forestry is a very active management strategy that includes managing selective harvesting, attention to pruning of the best trees and sometimes under-planting with other species. Lucy has been working on this COFORD LISS project for the last 2 years and the results will form a published paper. It will be an important baseline for Ireland’s forest industry as it moves towards a more deeply sustainable, non-clear fell, active forest management, a new framework that secures long term and increasing ecological and economic benefits to and from our Irish forests. LISS –The Low Impact Silvicultural Systems in Ireland (LISS) research project aims to expand the knowledge base on sustainable forest management in Ireland. The project is run by University College Dublin, the forest management research company Purser Tarleton Russell Ltd. and the semi-state forestry company Coillte Teo, and is funded by COFORD, the National Council for Forest Research and Development in Ireland, Department of Agriculture, Fisheries and Food. The project is directed by the Project Coordinator, guided by the Project Steering Group consisting of the Project Coordinator and representatives of the participating companies and national and international experts (some from ProSilva Europe). Great photos, and well done on the inspection. Strange how the forest can look so dry in the pix!